2011 March — Dayna Macy, author of "Ravenous"
I was interviewed for a piece on curvy women and yoga. I find it interesting that a few people who read my book excerpt in the January issue of Yoga Journal took away from it that my desire to lose weight meant that I believe that curvy (or fat — call it whatever you like) — people should not do yoga. I can honestly say that in 20 years of practice, that thought never once has crossed my mind. If I believed that, I wouldn’t have started doing yoga two decades ago, nor would I be doing it today. I believe yoga is for every body, but not all yoga is appropriate for every body. This goes beyond weight, to also include age, physical condition, and temperament. Straps, chairs, blocks, blankets can be used to modify poses, while some are simply contraindicated. No. I wanted to lose weight to feel more comfortable in my skin, not because only skinny people do yoga. On a separate but interesting note, in yoga class today, one of my wonderful yoga teachers, Jason Crandell, took us through various asanas that focused on the lateral breath — expanding the body from side to side via the breath. It was an interesting and satisfying class. I’ll be at the Commonwealth Club in SF this Thursday on a panel titled “The Art of the Food Memoir,” with wonderful Bay Area food writers Kate Moses and Romney Steele, moderated by Davina Baum of Chow. Reception starts at 5:30 pm, panel at 6:00, signing at 7:00. 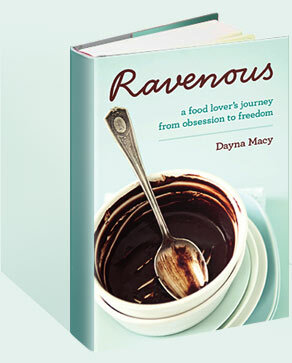 My wonderful publisher Hay House is running a Facebook promotion for Ravenous. The first of three contests asks you to write a brief post about your favorite food obsessions (chocolate, cheese, olives, you name it), then click on a link to include your contact info. Winners will win a copy of Ravenous and a pair of passes to Hay House’s I Can Do It New York event. It was both weird and thrilling to see my face peeking out of the SF Chronicle yellow news boxes. Here’s the piece! Here I am on my first TV gig on KRON-TV. Here’s my interview with Nick Lawrence of WEEU-AM in PA.
Oh frabjous day — it’s like Hanukkah in March! Got a bunch of new press recently including Dailyspark.com and Daily Om (exerpts), Creator’s Syndicate, and more.